Time to start thinking about catching those pesky juvenile salmon and steelhead eating northern pikeminnows, and earn some money while you do it. 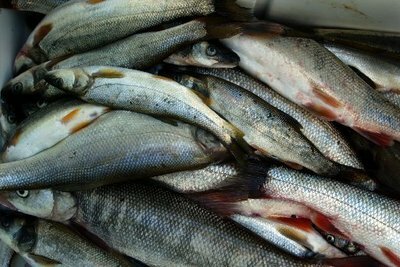 The Northern Pikeminnow Sport Reward Fishery Program kicks off Tuesday, May 1 through Sept. 30. Each year northern pikeminnow eat millions of young salmon and steelhead. For the past 20 years, the Bonneville Power Association's sport-reward program has reduced predation on these fish of concern. Fish that are turned in as part of the reward program are used in liquid organic fertilizer for agriculture and fish meal for poultry and dairy cattle feed. The public is invited to attend an event hosted by State Fish and Wildlife, Pacific States Marine Fisheries Commission and the Bonneville Power Administration from 10 a.m. to noon Tuesday, May 1 at the M. James Gleason boat ramp. Expert pikeminnow anglers and biologists will be on-hand, and there will be a close-up view of pikeminnow in an aquarium, workshops on how to reel them in, prizes and giveaways and the registration process. The boat ramp is located on N.E. 43rd Ave. and Marine Drive. Take Exit 307 off of I-5, head east on N.E. Marine Drive. The boat ramp is across from Portland International Airport at 15475 Ferry Road. The total catch in 2010 was 173,981 fish on 25,271 angler trips. Catches must be checked in at the station each day, and reward vouchers will be given. For details, call 800-858-9015 or visit the Pikeminnow Reward Program website.